Special rule for flights to Tehran. Stewardesses for Air France have been ordered to wear headscarves when flying into Iran’s capital of Tehran and they’re not happy about it. The order has sparked a backlash. Air France stewardesses, furious at being ordered to wear headscarves in Tehran, say they will refuse to fly to the Iranian capital when the airline resumes the service later this month. Female members of flight crews have been ordered to cover their hair once they disembark in Tehran and unions are demanding that the flights be made voluntary for women. The resumption of a thrice-weekly service between Paris and Tehran, planned for April 17 after an eight-year break, follows a thaw in relations since Iran agreed to dismantle large sections of its nuclear programme. Iranian women have been forced by law to cover their hair or face stiff fines since the 1979 Islamic revolution. In staunchly secular France, however, public signs of religion have been frowned upon since a 1905 law separating church and state. French women see Islamic headscarves and veils as an affront to their dignity. Headscarves are banned in French state schools and offices, and it is illegal to wear the full-face Muslim veil in public. Air France hasn’t been flying to Iran for years but is set to resume flights there because of Obama’s nuclear deal with the country. Perhaps France is looking to get their hands on some of the sweet cash that came with the deal. 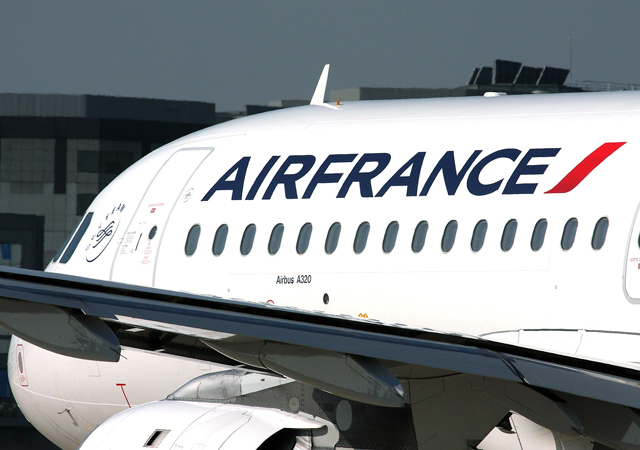 Air France is set to resume service to Tehran on April 17 after an eight-year break. The service was initially cut as part of international sanctions related to Iran’s nuclear program. Following the 2015 nuclear deal struck between Iran, the U.S., France and several other countries, Air France announced it would fly once again to the tourist-hungry country. Specifically, Air France’s modesty rules require women to wear pants during the flight from Paris to Tehran and a loose fitting jacket and headscarf when they exit the plane. Those that don’t comply could be penalized, Christophe Pillet, an SNPNC spokesperson told Agence France-Presse. Air France told the AFP that the headscarf rule was not new. It was in place before service to Tehran was cut in 2008. Will American feminists stand up for the ladies of Air France? Featured image is a screen cap. There is that “when in Rome” thing. However, if there are no women willing to work for Air France, then the airline can either not fly to iran or place male flight attendents aboard the iran flights. Personally, I wouldn’t work for anyone who who require me to place one foot in an islamic country until there is real respect for women in those cultures. Western women fought hard for equal treatment and they should not have to take a step back because of 7th century thinking and thug behavior by those in the middle east. Excellent, ladies of Air France! But if we show respect for Islamic Culture perhaps they will cut off hostages heads quickly, with a sword instead of a knife. So much more humane. These women are fighting a rear guard action in a French retreat. Instead of the Germans rolling over them, they are inundated with Muslim immigrants. The French language will give way to Arabic soon. The fetid French only understand surrender. You’re such a troll. Oh, sorry, I meant “tool”. What I am is saddened by the decline of a great culture. Air France should just hire some of the muslim immigrants as flight attendants for the Iran flights. They have a lot to chose from, and more arriving every day. It would be even better if Air France made the flights for their new Muslim flight attendants a one way flight. Are Iranian women required to remove their headscarves when they leave Iranian air space? What’s it cost…umm, I mean pay, to be a member of the delegation? For you, mon ami, half price: $50. Ah yes, a bargain at half the price! So now it has been left up to stewardesses to defend their own human rights. Aren’t we all so proud of our modern, liberal, progressive governments, that have told us over and over again how they are going to protect our rights and keep us safe? Haven’t we seen how our government has deliberately attempted to make criminals out of horny, harmless male college students, while refusing to take effective actions against potential terrorists and real felons coming in from outside our country? This story contains one thread of why Bernie Sanders and Donald Trump are getting so many votes. Although some people would have us believe it’s all old, white, uneducated Republican men voting for Trump, it’s not. It’s a solid majority of Americans voting against BOTH parties. There is a very broad spectrum of Americans that see their government behaving foolishly, and very much ready to follow in the footsteps of the much-less-successful European governments. The problems of proper dress in Moslem countries…. They should wear head scarfs and nothing else. So, all the Paris attack wringing-of-hands is over. Muslims are good guys again.